*Note: An additional $10.00 shipping surcharge is required. Big loads of laundry? No problem. This dryer's huge 49-1/2 linear feet of drying space, plus its unique shape enable you to dry more clothes, faster. Its full arch allows air to circulate around wet clothing for quicker, more even drying. Ideal for use outdoors or inside; you can even set it up over a furnace vent or fan for added air circulation. Crafted of solid wood with clear vinyl tubing over wooden dowels to eliminate marks on clothing and prevent mildew. Overall I am pleased with the arch drying rack, BUT I do think a better job of sanding the dowel ends could be done and will be doing myself so it doesn't snag. I can hardly wait to put it outside in the sunshine. Great for the summer cottage. I use this to dry clothes indoors and outdoors at the cottage. Great for dying clothes indoors on rainy days. Fits a lot of clothes! Sturdy enough for men's jeans and big towels, but lots of hanging area or lots of little items too. Perfect, just what I wanted. Folds up compactly for storage. I've used this for several summers, and it is still just like new. Perhaps this rack, as wonderful as it is, should be marked carefully that it is best for indoor use only. The wood is kiln-dried, so if the rack accidentally gets left outside on a deck and in the rain, as ours did, the wood soaks up water and swells and the rack can't be opened or closed. We're trying to dry ours out in hopes of saving it, but one of dowels swelled enough to split the wood brace that holds it. So, best for indoor/sun porch use only, unless you are sure you will never forget to bring it in. Years ago I found a smaller and flimsier version of this dryer. Had never seen this type of clothes dryer before. It made so much sense and worked very well. Holds a whole load of laundry. When I saw this one from Lehman's I was very excited. Boy was I surprised to find that this dryer has way more drying space than the first one I got and is much sturdier! I like being able to hang all my shirts IN the arch! This really can hold two large loads! Love the plastic sleeves over the dowels! I have an electric clothes dryer and I live by myself. This clothes dryer dropped my electric bill by $50! Too many people are trying to save money by doing things like removing the light bulb from their refrigerator. This device represents REAL savings that doesn't cause inconvenience to the user. Kudos the Amish. OK, I am going to confess: I did not buy this from Lehman's. I have an old one, no idea how old it is! I love it. I don't have a dryer, and on those days I can't hang things outside, out come my racks. This one is great for jeans and bath towels and other big items that don't fit on the upright rack. For the lady who found it hard to set up, I am very small and do not find it difficult to manage. I guess it's all in the technique. I lay it on the floor, lift the rung on the upper side enough for me to grab the upper rung, and then pull it up and position the legs. It takes seconds. I fold it just like you would a fan: lift the bottom rung while steadying the top, and fold it all together, laying it on the floor as I go. Then I can pick it up and set it on the shelf. I LOVE the other Amish drying racks and when this came out, just had to have. It seemed perfect. However very disappointed for the money it cost. My intention was to be able to use outside on the deck, however it's not made to fold and unfold and move around. Also, no opening instructions. One of the rungs broke when I was setting it up and now one of the legs is cracked. I just bought this a month ago and took it out of the box a few weeks ago. Maybe I got a defective one, but NOT worth $129.00 that's for sure. A friend recommended Lehman's because we just moved and didn't have space for a standard laundry line. 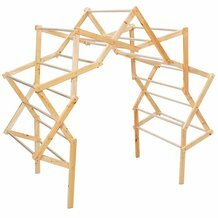 Our arch rack suits our needs perfectly. We haven't found laundry pins that fit on it yet, but the little stuff we hang a hanging rack (separately) and the big stuff we hang on the arch rack and it doesn't fly off in the wind. I knew this was going to be large but I had no idea just how large it was going to be. I like it and I am using it but it is hard to open up and close. So if you do not have upper body strength do not get this. But I love the amount of clothes I can put on it. This is my first purchase with Lehmans. 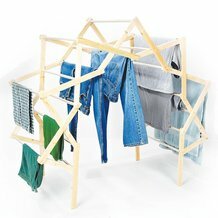 The Arch Drying Rack is exactly what I needed to get my clothes dried faster. I can put jeans on the rack in the late evening and they are dry by morning. It was easy to open up by myself and easy to place it where it will live. These folks ship FAST, and the design of this item is excellent. We especially like the vinyl covering on the bars, and the fact that you can hang 5 bathtowels without interfering with the other bars. It's a little tricky to set up, especially the first time. However, the craftsmanship, compared to the best quality large one we bought a few years back, is disappointing. The side bars are not sanded, so there are sharp edges and even splinters. Instead of screws holding the bars in place, there are finishing nails. But the biggest problem is that the wood rails are only 1/2 inch, not 3/4 inch. That's a big difference when it comes to strength. Not up to Lehman's usual quality, but way better than the box store stuff.